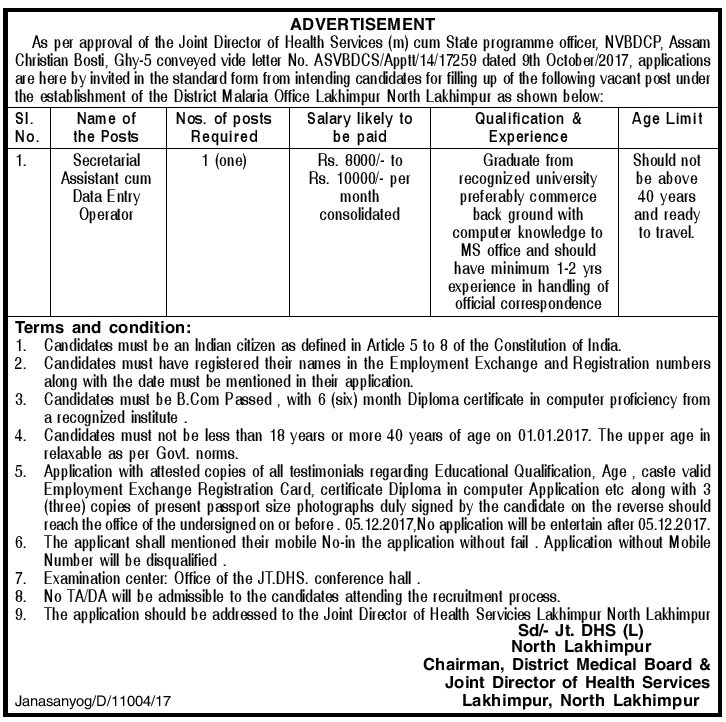 Applications are hereby invited in the standard form from intending candidates for filling up of the following vacant post under the establishment of the District Malaria Office Lakhimpur North Lakhimpur as shown below. Qualification & Experience: Graduate from recognized university preferably commerce back ground with computer knowledge to MS office and should have minimum 1-2 yrs experience in handling of office correspondence. Salary likely to be paid: Rs.8000/- to Rs.10000/- per month consolidated. Age Limit: 18 to 40 years of age 01.01.2017. The upper age limit in relaxable as per Govt. norms. Application with attested copies of all testimonials regarding Educational Qualification, Age, caste valid Employment Exchange Registration Card, certificate Diploma in computer Application etc along with 3 (three) copies of recent passport size photographs duly signed by the candidate on the reverse should reach the office of the undersigned (in the official advertisement) on or before 05.12.2017.